Salisbury Town Manager Neil Harrington – A new board of selectmen that won’t bobble their heads every time he opens his mouth. Lenny Degnan – A big fat conviction for his role in the Lantigua administration and his treatment of city workers during his reign of terror in city hall. Lawrence Mayor-elect Dan Rivera – Scott Jenkin’s ACT security team. After defeating Willie Lantigua for mayor, he is going to need all the personal security he can get. David Torrisi – A legislative citation from Diana DiZoglio for his years of service to the illegal aliens in Massachusetts and the Willie Lantigua administration. He did try to redeem himself by supporting Dan Rivera for mayor this year, but Santa still has TWO naughty X’s next to David’s name, so it looks like he still has some penance to do. The Lawrence Police – A new chief who will give the officers on the street credit instead of claiming it all for himself like former Chief Romero used to do. Also a chief who will not play race politics and will cooperate with all members of the press instead of buying the local daily to pay his resume. State Auditor Suzanne Bump – A shiny new calculator and a fresh set of pencils to help her audit more of the social programs that are being ripped off every day in Massachusetts by state workers and their co-conspirators in the private sector. Lawrence City Attorney Charlie Boddy – A pink slip. The State Taxpayers – An indictment of Willie Lantigua and his election department. Lowell Councilor Rita Mercier – A candlelight dinner for two at Tom Duggan’s favorite restaurant. Billy Manzi – A book called ‘How to Hatch a REAL Conspiracy, Ten Steps to Dinner Table Conversations that will keep you out of court’ Santa crossed out the author’s name. Essex County Sheriff Frank Cousins – At least four more investigations and a media with the balls to report on them. State Rep. Diana DiZoglio – Some Ritalin and a bottle of Nyquil. If you’ve ever met State Rep. DiZoglio, you might have noticed she is a little … high-strung. Congressman Niki Tsongas – The good sense to actually question the president and other democrats before carrying their water and shilling their message to her constituents. Tsongas was elected to advocate her constituents concerns to the president, not advocate the president’s propaganda to her constituents (without question) when she promised you all that “you can keep your doctor”. Congressman John Tierney – Some new talking points so he doesn’t have to be stuck with pointing to his opponent and saying “tea party extremist, tea party extremist, tea party extremist”. Last time he ran against an openly gay candidate in Richard Tisei, who was neither a tea party member nor an extremist, and he is facing him again this coming year. Shouting “tea party extremist” may not cut it this time. Governor Deval Patrick – A copy of Dante’s Inferno. He is going to be there soon and he should probably have an idea of what is waiting for him. Andover Selectman Vispoli – A senate win. Charlie Baker – Two hours free coaching from yours truly, on how to make conservative arguments using liberal talking points, and neutralizing a hostile media. State Rep. Jim Lyons – New neighbors who are not convicted criminals. Attorney Sal Tabit – Better clients and a copy of the Valley Patriot’s deadline schedule for 2014 so he will schedule his famous pig roast on a night I can actually make it. Haverhill Mayor James Fiorentini - A framed copy of the Eagle Tribune’s story that outed him for blogging on their webpage under an assumed name. It seems Jimmy has forgotten how the Tribune took his confidential information and plastered it all over the front page, because he is still kissing their backsides. Al White of the Eagle Tribune – More of what he got in 2013. Haverhill School Committeeman Paul Magliocchetti – A subscription to the Valley Patriot to inspire him to start writing a column and inform the people of Haverhill what is going on in their school system. Lawrence School Receiver Jeff Riley – A win for Charlie Baker as Governor. State Rep. Lenny Mirra – More Republican colleagues come November so that the House of Representatives will be more balanced. Shawn Toohey – The good sense not to try and run for office again. It’s only going to end the same way it did last time. Senator Ives – Lots and lots of presents! Though Ives is a liberal democrat who considers herself a “tree hugger” , she has a 70% rating from Mass. Fiscal Alliance, she supported penalties for violations of the state’s public records law, she opposed the gas tax, signed on to repeal the tech tax, and has stood with her constituents on most major issues. PuppyGirl – The job of being the MC of The Valley Patriot’s 2013, tenth anniversary BASH in March. Methuen Mayor Zanni – A free subscription to the Eagle Tribune. I hear they mayor REALLY likes that paper. Elizabeth Warren – The Movie Pinocchio on DVD. Jen Kannan – 20 minutes alone in a room with Laborer’s Union President Mike Gagliardi, no cops, no bodyguards, and nobody leaves the room till the buzzer goes off. DJ Deeb – A trip to Jerusalem to meet with BB Netanyahu so maybe he will get it on the Palestinian question. Marcos Devers – A reelection to his state rep. seat by a larger margin than he won last time, which was 86%. Linda Dean Campbell – Singing lessons. Santa has something scribbled in the margins about Saint Patrick’s Day, but I can’t make it out. Barry Finegold – An apartment on Park and Hampshire Street in Lawrence so he has to live in the conditions that he is responsible for doing absolutely nothing about in the last 16 years he has been an elected official representing the city. Steve Grossman – An audio tape of his interview with Tom Duggan where he promised that if he was elected he would help the Valley Patriot put teeth into the state’s public records law. Maybe if he hears his own words making a promise, he might actually learn how to keep them. 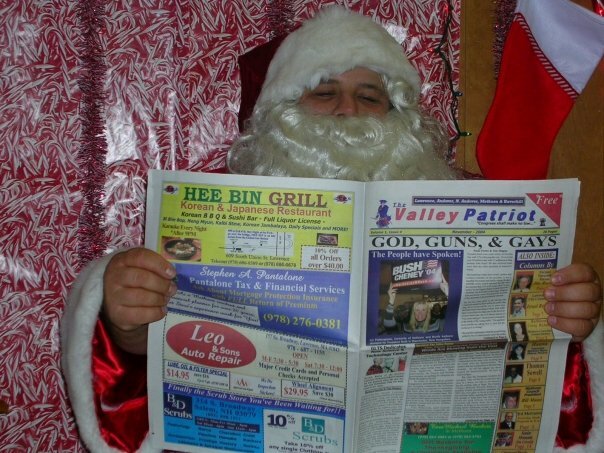 Obviously Santa Claus is “paying attention” to when people are naughty or nice and thanks to Tom Duggan and the Valley Patriot we know who they are!! !